« Carrots are “off the hook”! 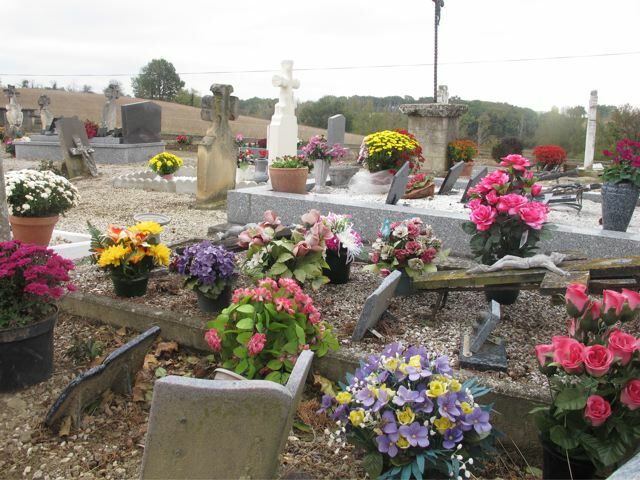 Every year at this time the cemetery on the eastern side of the prebytère fills up with flowers–real and artificial–as relatives arrive all week to pay their respects and remember. By November 1st it is full of colour, as the spotlight falls briefly on the tombs and graves of loved ones who have passed. This annual pilgrimage of remembrance is a fine tradition which was new to us when we arrived. But we’ve adopted it–or more precisely, adapted it…. 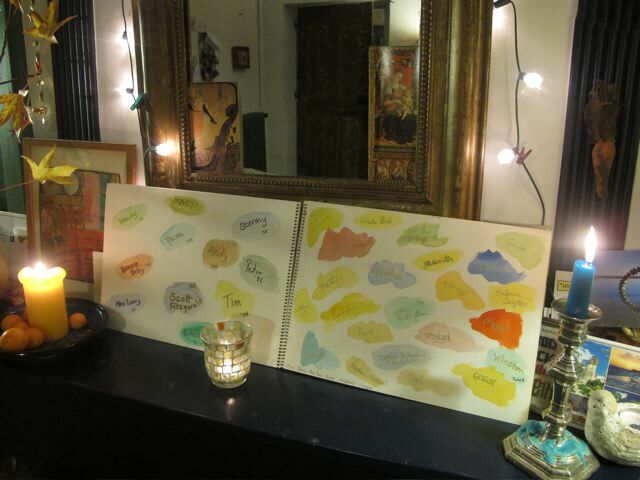 On this day each year we open our Sketchbook of Remembrance–add the names of those that have died since last November and light a candle for everyone on the pages. Family, friends and even beloved pets. None of our parents was alive when we met. We’re sure they would have got on however–despite the cross-cultural differences (Chicago and London!) and searched for common ground–even literally. We like to imagine them in the garden here –all four were keen gardeners. Meredith and I would happily have sat back and watched, while Dodie & Speed and Molly & Tony rolled up their sleeves and “mucked in”! We’d have their “gin & tonics” or “whisky & sodas”–the chosen tipple of that generation–on hand at the end of the session and look forward to some “grown up talk” among equals. It’ll never happen of course and we miss them. But this adopted ritual in a foreign land helps in remembering them at this time when–so it’s said–the veil between the worlds of the living and the dead is at its thinnest. Meredith Robin what a lovely way to remember your familes.They I am sure would be very proud of the way you are living your lives together. This is so beautiful. I can almost see them all in your garden. And they are happy. Warmest thoughts and gentle care to Robin and Meredith and to all. Thanks to you too, Kathy. How beautiful. Every year I have a ritual as well with my children, in which we go to my husband’s grave, and remember him. We have brought the son and daughter-in-law, as well. How sad that you lost your brothers so young. My husband died young, as well, and we feel it is important to keep his memory alive. His laughter and jokes live on! Meredith and Robin; Looking back with love, looking forward with hope, and seeing the present for what it is – a gift! Thank you for sharing. Thanks to you too Lynn. Robin, this was very touching. Thank you for sharing. All Saints` Day (Allerheiligen in German) is a day of remembrance in the catholic parts of Germany. We have two graves for my grandparents and relatives and for my father, who died with 32 years by an accident. Today it is a special atmosphere on the cementery. Candles burning on each grave. Absolutely beautiful…we have ‘yahrtzeit’, the Jewish tradition of a candle lit for 24 hours on the anniversary of the death of a loved one. It was Paul’s father’s ‘day’ last Tuesday…there is something so reassuring about the tiny, steady flame, keeping vigil all through the night…remembrance is so important. I’m so lucky to still have both my parents – Paul says that the realisation that you are an ‘orphan’ is a difficult one however old you may be. I love the different remembrance traditions throughout the world – and yours is so personal and lovely. As has been said before, both sets of parents & brothers would be very proud of their beloveds, I’m certain. Thanks, Rachel–good to learn about “yahrtzeit”. So did you start the scrapbook after you settled in France? Yes we did–inspired by the traditions of Toussaint. When your post came through my email, I was feeling a little down. Seeing the beauty of these remembrance traditions and of your sketchbook lifted my heart, despite the loss behind them. I hope doing this lifts yours and Meredith’s hearts as well. I lost a sister when she was 50 in 2003 and I know the feeling of a sort of “lost appendage” that can come over the surviving sibling. I also have lost my parents, so I do understand. I’m very glad you and Meredith can share in this together. My best to you both. Thank you, Debra, for your kind thoughts and for sharing your story. Hello Robin, Nice story.I think every day on my oldest sister and mother and the lost pets, they are actual never away. What I find sad and wrong here in Belgium is that many cementaries have a short duration of the graves some 20 and some even only 7 years.Only a few have the old system(like by my mother and sister) of 50 years and continuation renewal for a other 50 years resting. I find it should be eternal like in Ireland(there for hunderds of years ).Also in France I think 6 different places have that system of a very long duration, and I hope they keep those 6.That’s why I like to be buried(when my time is there in France). I have noticed this too, Chantal. Compared with cemeteries in The UK , French ones never date back very far. I done some research in this matter before for France, because I would like to life overthere and also that matter is important for me. There’s a difference between a normal concession (for 15,30 or 50 years) or a Cimetière perpetuelle.The perpetuelle is the eternal (expensif!) I include hereby a list with a example for Marseille with prices(a few years back).The sites:www.cifif.asso.fr and wwww.liberation.fr might be also be information in this matter. Sun is shine here in Belgium, kindly regards,Chantal. A lovely way to remember those we have loved and lost. Pete was a dear friend of mine during our teenage years. I often stayed at your flat in Pimlico and I think I even visited your parents home in Pinner (is that right?) I have only happy memories. We had such fun. I am glad you have found such a peaceful life in France. What a lovely ideato have the flowers for All Saints Day. Here it is very mundane- as a Catholic I went to the 7 AM Mass as it is a Holy Day of Obligation. I especiually liked that line at the end- “the veil between the worlds of the living and the dead is at its thinnest.” I strongly feel that my husband who died nearly 4 years ago is in Heaven. I wondered if he was looking down this afternoon when I had to have 2 root canals and the novocaine wouldn’t work. . Thanks for a lovely post……..
Maybe he was, Louise–“on ne sait jamais”–you never know! I am truly enjoying your blogs on such a myriad of topics. This one especially caught my interest, as a short time ago my beloved Dad died. He was a special man and is missed by all who knew him. Although, I was against burying him, I was out-voted as he was a practicing Jew, and cremation is forbidden. This is a long way around to share I’ve been comforted at his grave to see he’s surrounded by family members dating back over 200 years. It gives me great pleasure to know they’re carousing, drinking, and chasing women throughout eternity. We wondered about the partying going on too, Sheila! Sorry for the loss of your father–but comforting to feel he’s not alone. Many thanks to share us your thoughts for our and our souls. I agree with you absolutely. And today is the DAY of our souls, “All Souls’ Day”. I love remember my dearest grandmuns an grandads, “they was the best thing of my life” and with my dear uncle Ennio. They repose at the great, wonderful ancient and historical cimitery of Trespiano on Florence’s hills. A beautiful site with a view on Florence, romantic and commerative cimitery. Stay there made my heart glad….. My lovely cats -first generation- repose on my parent’s country house under the tree. Repose in Pace all Souls. Thank you Robin. You’ve made me want to search out the cemetery at Trespiano–thanks, Beatrice. I was away from a computer yesterday and so only read the post this morning. It is a lovely crisp sunny London morning and I have just walked to work through Mount Street Gardens – bliss! I loved the post and can empathise in so many ways. I really loved the reference to the “veil between the worlds of the living and the dead being at its thinnest” – just wonderful writing. I always like to think of sunshine after darkness (post tenebras lux) in the way I try to see life. Hope you and Meredith can remember the good times to comfort you both in the agony of the darker days. Be Well both of you. What a boon to be able to walk to work in central London!–and with the sun shining. Many thanks Robin! Just 6 months ago I looked for Trespiano’s Cemitery on internet, but there are not web-site. You can find some imagines via Google Imagine or via Comune di Firenze Servizi Cimitero. Happy to have interest you on, have a good afternoon! !